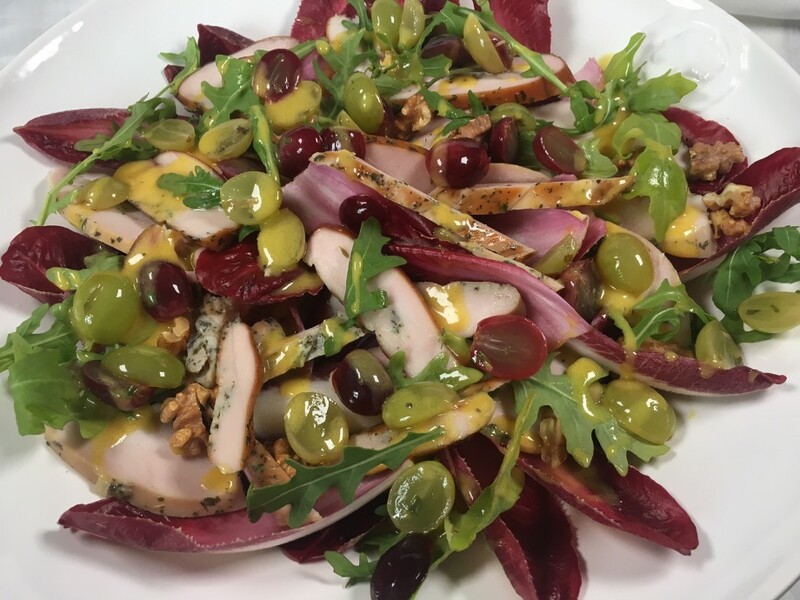 I remember first eating pickled grapes at the wonderful Painswick Hotel in Gloucestershire. They were served with the cheeses but I think they are suited perfectly in this salad-to add a burst of mouth-puckering sourness which compliments the smoky richness of the chicken. I buy smoked chicken breasts from Sainsbury’s but you can substitute plain cooked chicken breasts if they are difficult to find. I haven’t tried it yet, but I think hot smoked salmon would make a fine bedfellow for the pickled grapes and chicory too. Pickle the grapes for 2-3 hours, or 24 hours if you’ve got the time. 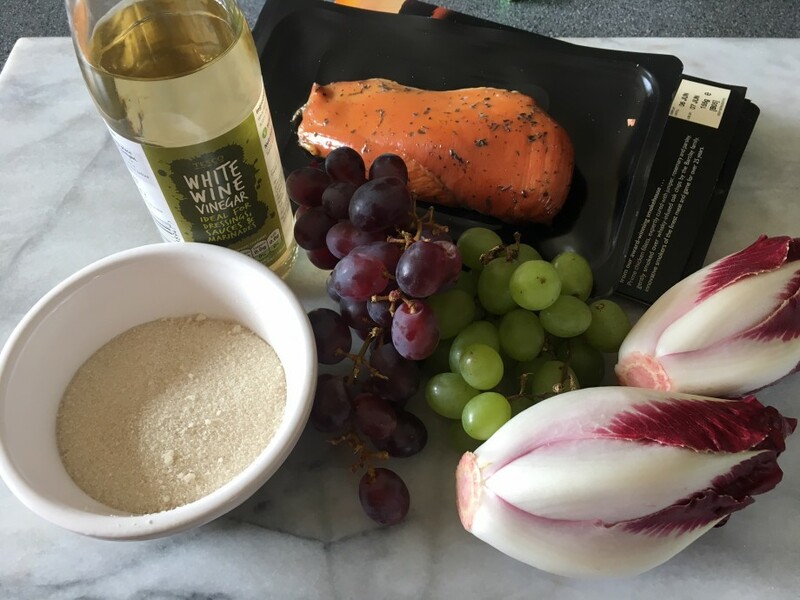 You may not think it, by looking at the rather long list of ingredients, but this is a very simple salad. For the dressing, put the ingredients in a jar, screw the lid tightly and shake to emulsify. Set aside. 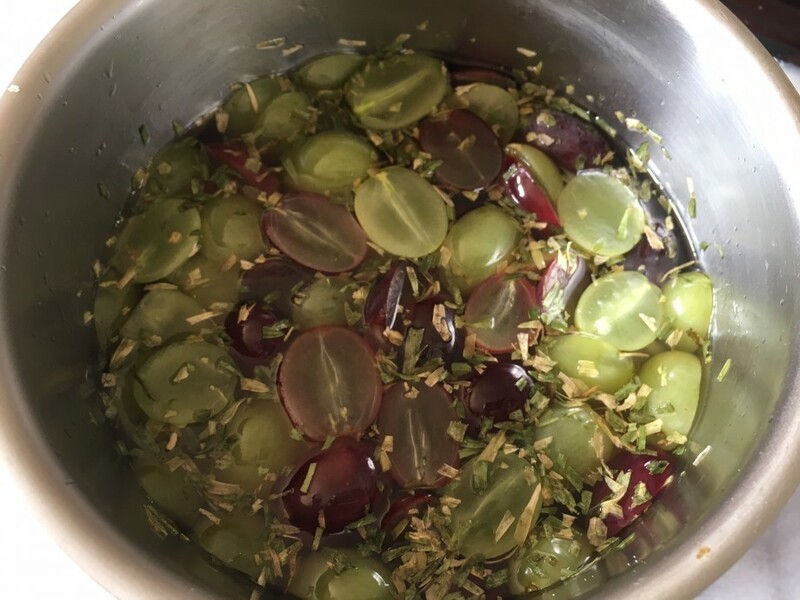 For the pickled grapes, put the vinegar, sugar and tarragon in a saucepan and stir over a low heat until the sugar has dissolved. Add the grapes, stir and leave to cool. When cold chill for up to 24 hours. For the salad, arrange the chicory leaves in a wide salad bowl. Top with the sliced chicken breasts and scatter over the walnuts. Drain the grapes -I keep the vinegar to pickle other vegetables-and scatter over the salad. Add the rocket leaves and finally drizzle over the dressing.